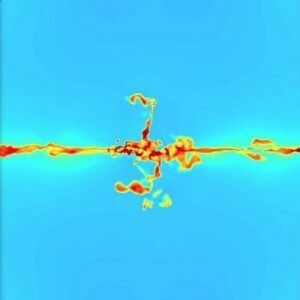 Much of the modeling of astrophysical systems focuses on dynamical behavior. That is, how stars, planets and interstellar clouds move under the forces of gravity. While such dynamical modelling can prove useful for studying the motion of galaxies, they are not quite as good at modeling the evolution of galaxies. That’s because galaxies evolve over time not only due to the motion of stars within them, but they also evolve chemically as old stars die and new stars form. The chemical makeup of new stars depends where and when they form. One way you can look at the chemical makeup of a galaxy is to examine the metallicity of stars. 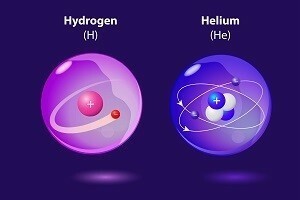 The metallicity of a star is a measure of how much a star has of elements other than hydrogen and helium. Usually this is done as a ratio of iron to hydrogen, or oxygen to iron, for example. In our own galaxy, stars with high metallicity tend to be near the central region and galactic plane, while lower metallicity stars tend to lie further from the galactic plane. This variation in metallicity is due to the fact that more stars lie near the galactic center and plane, therefore more stars die in that region, which frees up more metal (elements other than hydrogen and helium) to be used in new stars. While it is fairly straightforward to model the broad trends of the chemical composition of stars with a galaxy, it would be nice to have better models. Enter a new attempt at a model integrating the dynamical motion of stars with their chemical evolution. The first results were presented in Astronomy and Astrophysics (paywalled, but the arxiv is here). In this paper the authors look at modelling the Milky Way. To model the chemical evolution of the Milky Way, the team had to account for the fact that stars have the metallicity of their surroundings at the time and location of their formation, but also that stars tend to drift outward over time. So metallicity is a product of both star formation and stellar drift. You can see the results in the figure here (from the paper). In the top row shows the stellar formation rate over time and you can see that star formation peaks at about 3 billion years and gradually tapers off. 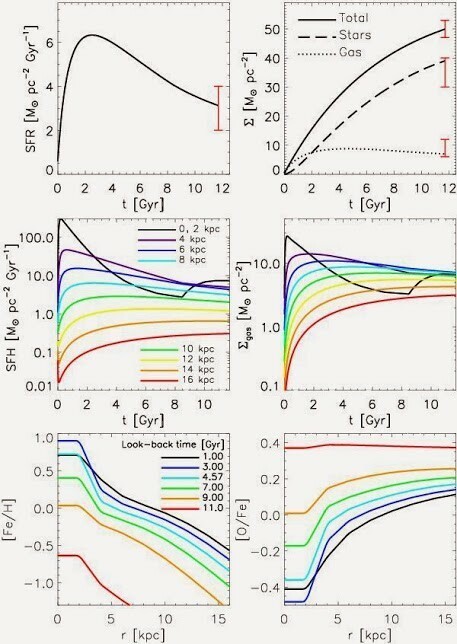 In the middle row shows a more detailed history, plotting the stellar formation rate over time at different distances from galactic center. The bottom row shows the metallicity in terms of the iron-hydrogen ratio and oxygen-iron ratio over at different times as a function of distance from the center. The results are a reasonable match to the Milky Way, and this allows the authors to do a bit of detective work regarding the real Milky Way and our Sun in particular. Given the metallicity of our Sun, and its current location about 26,000 light years from galactic center, the authors calculated that our Sun likely formed at a location 18,000 light years from the center, and then gradually drifted out to its present location.